A 6-year-old female child presented with a history of headache and vomiting with two episodes of generalized tonic–clonic seizures following which she had transient left hemiparesis. History also revealed that she had contact with a pet dog at home. General physical examination was unremarkable. On central nervous system examination, the patient had left-sided supranuclear 7th nerve paresis grade II. The tone in the left upper left/lower left (UL/LL) was increased, and power was 4/5 in both UL and LL on the left side. The deep tendon reflexes were brisk on the left side, and the plantar was extensor. The patient underwent noncontrast computerized tomography (NCCT) head, which revealed large, intraparenchymal nonenhancing hypodense lesion with a well-circumscribed border in the right frontoparietal region with no perilesional edema [Figure 1]. Magnetic resonance imaging (MRI) brain revealed multiple thin-walled cystic lesions involving the right high frontoparietal lobes with core of the lesions showing cerebrospinal fluid (CSF) like signal intensity in all sequences, i.e., hypointense on T1-weighted imaging (T1 WI) (a) and hyperintense on T2-weighted imaging (T2 WI), (b) getting suppressed on fluid-attenuated inversion recovery (FLAIR), (c) with no restriction on diffusion-weighted imaging (DWI), and (d) [Figure 2]a-d]. One of the lesions showed internal septations/membranes on T2 WI (arrow), likely representing daughter cysts [Figure 2]b. 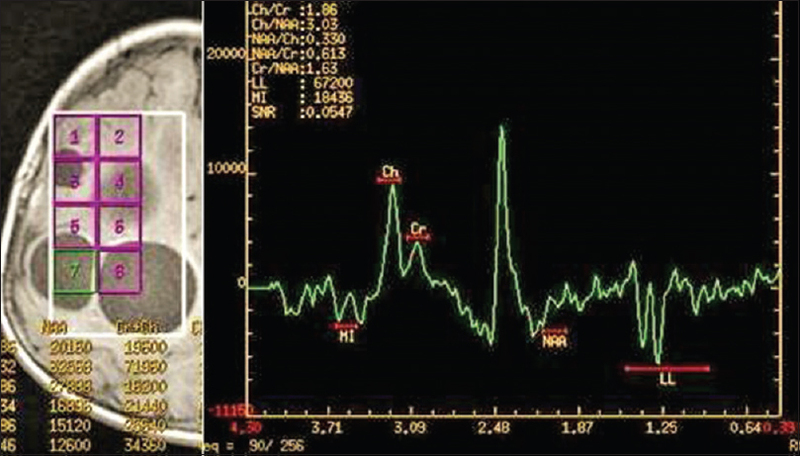 On contrast administration, there was a peripheral ring enhancement [Figure 2]e. Magnetic resonance spectroscopy (MRS) revealed characteristic peak at 2.4 ppm representing succinate [Figure 3]. These imaging features were consistent with the diagnosis of hydatid cysts of brain. 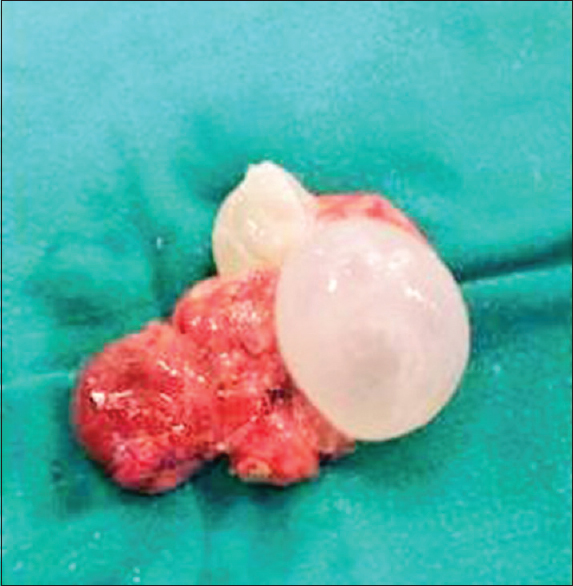 The patient underwent right frontoparietal craniotomy with in-toto excision of the cystic space occupying lesions; the cyst was multiloculated, pearly white, and six in number [Figure 4]. Hypertonic saline-soaked cotton patties were kept in the adjoining area to prevent the accidental leakage of the hydatid fluid in the normal brain. Cysts were adhered to the brain parenchyma, and meticulous hydrodissection was done using saline. The Dowling–Orlando technique was used to proceed with further dissection. There was a small rupture in one cyst which was controlled immediately and hypertonic saline irrigation done. The patient was extubated postoperatively and started on oral albendazole for 4 weeks. The patient was discharged on the 7th postoperative day. Histopathological examination confirmed hydatidosis. She is now on regular follow-up. At last follow-up, 1 year after surgery, her left hemiparesis has completely recovered, and she is seizure free. Postoperative MRI brain did not reveal any residual/recurrent disease. Hydatid disease or echinococcosis is caused by infestation with larval stage of tapeworm echinococcus. The main pathogenic species for human are echinococcus granulosus, which produce cystic lesions. All organs may be involved, with brain being involved in only 1%–2% of all infestations. The diagnostic tools include computerized tomography (CT) and MRI brain. The usual CT appearance is large, intraparenchymal nonenhancing hypodense lesion with a well-circumscribed border and no perilesional edema. The cystic lesion has attenuation similar to that of CSF. MRI shows a well-defined oval or cystic mass with signal intensities similar to that of CSF, sometimes with a low-intensity rim. The lesion typically shows no contrast enhancement, and calcifications, usually peripheral, are rare. Cystic lesions with perifocal edema and rim enhancement can be categorized as complicated. The lesion is hypointense on T1 WI and hyperintense on T2 WI, suppressed on FLAIR with no restriction on DWI. The lesion may show internal septations/membranes on T2 WI, likely representing daughter cysts, as in our case [Figure 2]b. MRS reveals characteristic peak at 2.4 ppm representing Succinate. Yang et al. studied MRS and susceptibility-weighted imaging (SWI) in cerebral alveolar echinococcosis. They concluded that in MRS; N-acetyl aspartate, choline, and creatinine are significantly reduced, an abnormally high and steep crest was found at 1.4 ppm. The phase diagram and strength diagram of SWI showed isointensity. The MRS and SWI of cerebral alveolar echinococcosis could provide important supplemental information for the diagnosis. The usual perioperative care includes adequate protection of surrounding perilesional area with saline-soaked cotton patties, in-toto excision, use of Dowling–Orlando technique for safe dissection and hypertonic saline irrigation in case of inadvertent rupture. Surgery should be followed by an adequate dosage of anthelminthic albendazole for 4 weeks. Gottstein B. Infectious disease. Hydatid Disease. 2nd ed. Edinburgh: Mosby; 2004. p. 1601. Tuzun Y, Kadioglu HH, Izci Y, Suma S, Keles M, Aydin IH, et al. 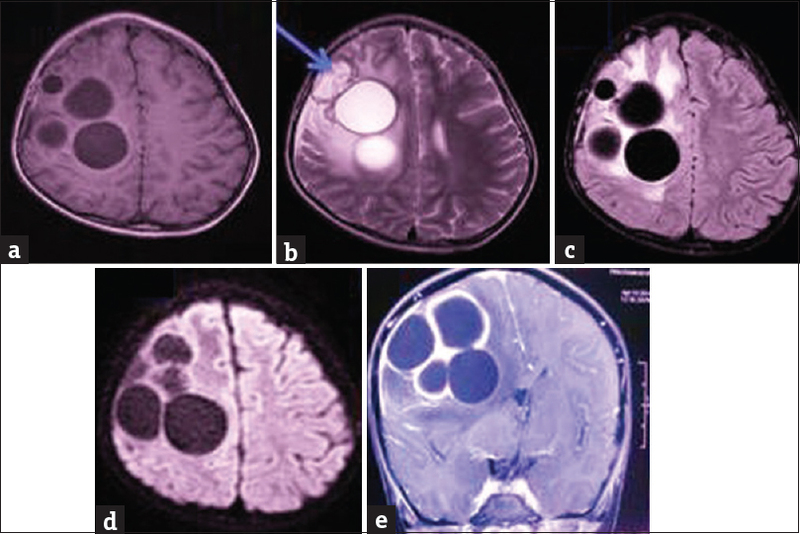 The clinical, radiological and surgical aspects of cerebral hydatid cysts in children. Pediatr Neurosurg 2004;40:155-60. Kireşi DA, Karabacakoǧlu A, Odev K, Karaköse S. Uncommon locations of hydatid cysts. Acta Radiol 2003;44:622-36. Yang G, Zhang Q, Tang G, Xu H, Yang Z, Guo J, et al. Role of magnetic resonance spectroscopy and susceptibility weighted imaging in cerebral alveolar echinococcosis. Iran J Parasitol 2015;10:122-7.